It’s official: we’re all mad for Black Panther. You could argue, if you wanted, that people’s enormous reaction to Black Panther’s inclusion in Captain America: Civil War indicates just how thirsty fans are for representation in comics and related media. And even as we celebrate an awesome showing of an awesome character in a huge summertime popcorn blockbuster, there’s still a massive elephant in the room: As of right now, depictions of headlining women of color in big-budget superhero films are dreadfully few and far between. The small screen, seen as a frontier for diverse representation and characterization, seems to be only marginally better. I’m convinced that Marvel just doesn’t know what to do with Spectrum. Everyone involved with her character doesn’t seem to realize that she deserves–no, needs–to be in an Avengers movie. She’s a born leader and self-taught crimefighter who’s led multiple Avengers teams. It’d take a smart writer to translate her kind of haphazard depiction in the books to the screen (hint, pull lots of her seriously unserious characterization from Nextwave: Agents of H.A.T.E), but I’m confident that her dazzling power and leadership ability would make it an easier job than it seems. Also, I know that she’s been depicted pretty often as looking like Halle Berry but, uh, let’s not make that casting choice. Okay? Okay. The Authority and Stormwatch were always some of my favorite “mature superheroes” books, and in those books we have a built in team of heroes that deal with some pretty wild universe level threats. Perfect for a thoughtful, yet setpiece heavy film with a young Quantum learning the ropes before taking the helm as a reluctant leader. Bonus: we get to see the Apollo/Midnighter ship onscreen. A Ms. Marvel movie actually stands a chance of being made in the next decade or so, unless the superhero movie industry collapse happens sooner than we think it will. I’m envisioning this movie in the vein of the original Spider-Man films, with Kamala getting an origin story and dealing with the pressures of being young and other while dealing with superpowers. A cool twist on a stale formula. Role: Spunky, lovable main character. Somewhere in between Avengers: Infinity War and Avengers: We’re Running Out of Licensed Characters to Use, there’s probably going to be a Young Avengers movie, which is great. 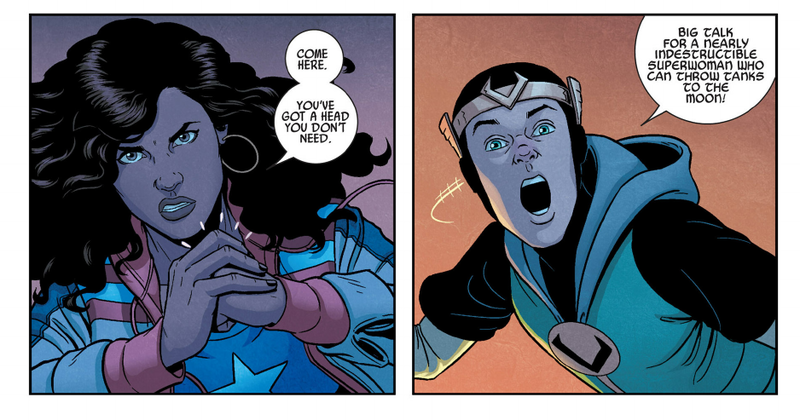 Ms. America is basically the most interesting character in the Young Avengers in my opinion, and it’d be sweet to see her throwing tanks to the moon on the big screen. While I highly doubt that we’ll ever see The Legion of Super Heroes in a film property, I feel like we as a people are slacking on our use of Dawnstar as a character. She’d definitely shine more in a team movie, and is there any real story reason why she couldn’t end up in a Justice League film? Dawnstar is too pure for the 31st century, and would be, in my opinion, a cool addition to the sausage fest that is likely to be the Justice League film roster of heroes–as long as she comes onto the team as a well-developed, thoughtfully created character. Leave the stereotypes on the cutting room floor, please. One thing that we rarely ever see is women of color as competent, well thought out villains which is exactly why Queen Bee is on this list. Imagine her serving as the mastermind leading the Justice League through a tangled web of plots that’s full of mind-controlled bruisers, only for us to learn that she’s really just doing everything that she can to make sure that Bialya’s tourism revenue stays high. Talk about sympathetic! Of course, the actual depiction of Bialya as a “terrorist” nation would need to be rethought, but there’s room for Queen Bee to be an antagonist at Lex Luthor’s level. Remember how dope she was in Young Justice? Monet St. Croix is and has always been one of my favorite mutants, and she also happens to be another one of Marvel’s criminally underutilized characters. M has an interesting backstory, but despite that she’s ultimately been portrayed as a hero, if a spoiled and stuck up one. Like Queen Bee, M would be a perfect candidate for a misunderstood villain whose evil deeds are based in good intentions. We’ve had so much Magneto in the X-Men films–perhaps it’s time for an all-new, all-different mutant supremacist? She’s also super-powerful, and I’d love to see her punch some X-Men (or Avengers! I’m not picky) through a couple of buildings. I think we can all agree that we’re sick of Batman films. It’s okay, you can admit it. Batman as a character is getting a little overdrawn, and no amount of prep-time can save him from that fate. Still, the Bat-mythos is a fertile playground to test out some new ideas, and who better to lead us into that transition than Cassandra Cain? Even if we have to get a Batman Incorporated or League of Batgirls squad-type film, as long as Cassandra is in some sort of leadership capacity and absolutely not the contrived stoic assassin type, it’ll be all good. She could also be played as an antagonist who later switching to the heroes’ side to take on a bigger threat. I’m still kind of salty that nothing ever came of those DC Nation animated shorts that Cartoon Network had going a few years back. They were, in my opinion, an obvious next step to the fantastic animated work that DC was producing. Well, we see how that ended up, but that doesn’t diminish the fact that Thunder and Lightning would do big numbers if a film or TV studio decided to take a chance on them. Think about it: training montages with Black Lightning! 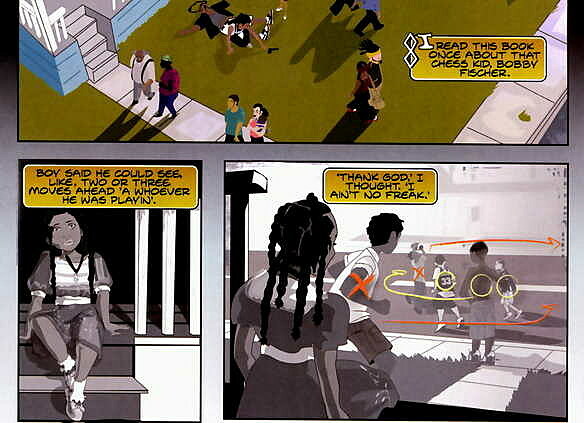 A guest appearance from Static Shock! A storyline that culminates with them working with the Teen Titans! I’m excited already. Make it happen, DC. All I’m saying is, point me in the direction of someone who doesn’t want to see a movie about a black woman from South Central Los Angeles billed as the second coming of Genghis Khan, and how she unifies the gang members in her neighborhood to fight against corrupt police who prey on her people? I’ve already made the film’s soundtrack in my head! We don’t even need to heavily modify the base story, because the Genius mini-series already had the narrative structure of a big-budget movie in the first place. All I’m saying is whichever studio wants to hazard a chance on adapting this fantastic story can shut up and take my money. There you have it, Hollywood. A group of totally free ideas for making superhero films that strongly feature women of color as important characters. It’s really a shame that it’s taken us this long to get women of color featured prominently in our favorite genre of movies, but now that we’ve made some progress on this let’s not stop…because I really want to see a Genius movie.